If you count yourself among the many aggrieved fans of Chuck Todd who've wept over him not getting the Meet The Press job, take heart! Todd will be receiving a new, high profile position from NBC News, who today named him Chief White House Correspondent. Congratulations are in order. But I don't care what title Chuck has at MSNBC. 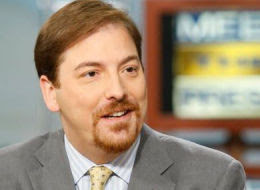 I will always heart Chuck Todd - and greatly admire his work, too.